Having recently taken possession of an HPT435BT, I'm faced with the need to cart the bulky radio antenna and ground plane around (not to mention the stiffly-coiled antenna cable), and I'm curious as to how others are storing these in their vehicles between jobs and setups. Any creative solutions for dealing with these not-very-compact bits of gear? Here is mine, similar to Kelly's. It's good to see green in the blue bag. For now the box and foam the radio came with will work nicely. I will leave the ground plane, TX cable and antenna assemble all assembled in box with foam wrapped around the radio that is also in the box. I will leave the power cable bolted to the battery in the case that came with the battery kit. The whip antenna then fits nicely in a piece of 1/2 PVC pipe I found in my garage, I just need to buy caps for the end of the pipe. I just throw mine in the back of the pickup truck. Works great!! This has been working great. I use the 1 watt radio. If your antenna is 36 inches total length, then this won't work, but you can include all other components...i have since added a bracket to mount the radio to an antenna rod as well as Verizon cellular hotspot for network setups. The stiff coiled antenna cable is in the lower left corner of the case. The charging adapters in the lower right are stored 2 deep. If I needed the 35 watt radio, it would be very tempting to try using the smaller 4 watt radio's battery and then simultaneously operate the radio and change the system with a small photo-voltaic cell. I might even try and mount the cell on the exterior of my pelican 1600 case above. ... i have since added a bracket to mount the radio to an antenna rod as well as Verizon cellular hotspot for network setups. That's cool, Jim. Which bracket; homegrown or store-bought? Is this case the one offered from Javad? In any event, and like Melvin Udall said: Nice packing. hmmm... Can the photo-voltaic charger keep pace with the nearly 9-fold work increase of the HPT435BT over the power needs of the HPT404BT? Or can it even keep pace with the needs of the HPT404BT? Regardless, it sounds like a fun project Jim and if you decide to explore this, please keep us posted. 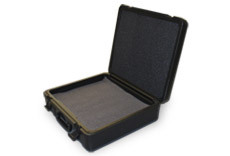 The Pelican 1600 case I used was purchased from Amazon for $185. It's fairly large and likely larger than the unit Javad sells. The bracket I use was fabricated from the mechanical drawing you created. Rather than using PVC and routering the angle, I had a client prepare the unit from 16 gauge steel. I painted it with Rust-Oleum FlexiDip Rubber Coating to protect the radio and rod. Oh dude! post a photo - please! Sounds very sweet. Very nice! What's the separator between the radio and the bracket? I used hex machine bolts with nuts to lock down the rubber washer and provide some separation between the radio housing and bracket to reduce scratching. The tolerance between the hex head and nut are not yet refined. Cool. So did the torque flare out the tops of those washers or are they conical to begin with? Those are the original, thin rubber washers. The torque caused the deformation. I haven't decided if this is acceptable. I'm leaning towards changing them. One idea that strikes me, and assuming that your primary intent is separation for the purpose of preventing scratches, would be to eliminate the rubbers altogether and replace the hex-head steel nuts with nylon nuts. I like your Allen Bolt Head solution better than what I am using for the two studs. Javad's bracket, which I bought and expect to arrive next week sometime will be used in product shots, but it doesn't feature the key-way. The Javad bracket is intended as a permanent fixture. If I make another one, I might explore using sheet aluminum for the bracket and the same studs as you've chosen, but I'll probably forego the hex-head nut and rubber washer. The other part of the mix for my next design is going to be how I get the fan arranged and mounted. The HPT435BT requires a fan. One solution is illustrated here. I have a case like yours but I need to purchase new foam so I can cut out for the equipment. Do you know where I can purchase new foam.